This high end custom residence features lake and mountain views through out the home. The house was designed by the owners as a private vacation home that has been opened up for the discriminating renter. The level access double door glass entry leads into the main space of the house containing the living room, dining area and kitchen. Travertine flooring, custom cabinetry and granite counter tops with designer stainless steel appliances provide a gourmet kitchen for those that like to cook and entertain. The kitchen includes a walk in pantry, an assortment of fine chef cooking tools, small appliances, microwave and a convection oven to handle all menu requirements. The dining area has seating for six with an additional two at the kitchen bar. From the living room relax on the Italian leather couch with lake and mountain views while watching the flat screen TV. Additional living space for relaxing and entertaining can be found on the adjacent covered patio facing the lake. Above the patio area is a large sun deck with 360 degree views of the lake and surrounding mountain ranges. The home contains three bedrooms and two full baths. All rooms have flat screen TV'S with Direct TV and wireless internet. The master bedroom is situated on the opposite side of the house from the other two bedrooms for additional privacy. Lay in the master bed and wake up to the peaceful lake views. Adjacent to the master bedroom is the large spa like bathroom. Travertine floors, granite counter top, double sinks, walk in closet, corner Jacuzzi tub and a walk in shower featuring a main water head along with a convenience seat and hand held wand. The other bedrooms feature a queen bed in one while the other has two double beds with a view of the lake. All bedrooms feature Berber carpet and ceiling fans. Second bath has a tub shower complimented by travertine flooring and granite counter top single sink. Laundry room includes a Washer and Dryer. The attached two car garage is available with the rental of the house while the detached RV garage is reserved for the owners. The parking area between the two garages has full hook ups for an RV. This clean quality home has a very private feel to it from the inside or outside on the expansive patio and courtyard area. The neighborhood is quite with very little street traffic. This rare quality view home is centrally located within three minutes of the London Bridge shopping area, marina and restaurants. THIS IS A NO SMOKING , NO PETS VACATION RENTAL. Bath 1 Jacuzzi Tub, Walk in Shower with shower seat and hand held and overhead shower head. His and hers granite countertop sinks, walk in closet and ceiling fan. Bath 2 Tub/Shower with single granite countertop sink. Overhead sun deck. Patio table with chairs. No expenses were spared when building and furnishing this custom home. Amenities include a gourmet kitchen with smooth top range, convection oven, microwave, dishwasher, pantry, various small appliances and utensils. Dining room seating for 8. In house laundry room with Washer and Dryer, Water Softener, Stainless Steel BBQ, Patio furniture with seating for 10, Local phone service, Direct TV, Flat screen TV in LR with Flat screen TV's in all three bedrooms, Surround sound stereo including patio area, Wireless internet access, Carpeted bedrooms with ceiling fans and quality bedding, Attached two car garage. Level access from garage, driveway and patio into house. All Utilities included. Centrally located three minutes from London Bridge. 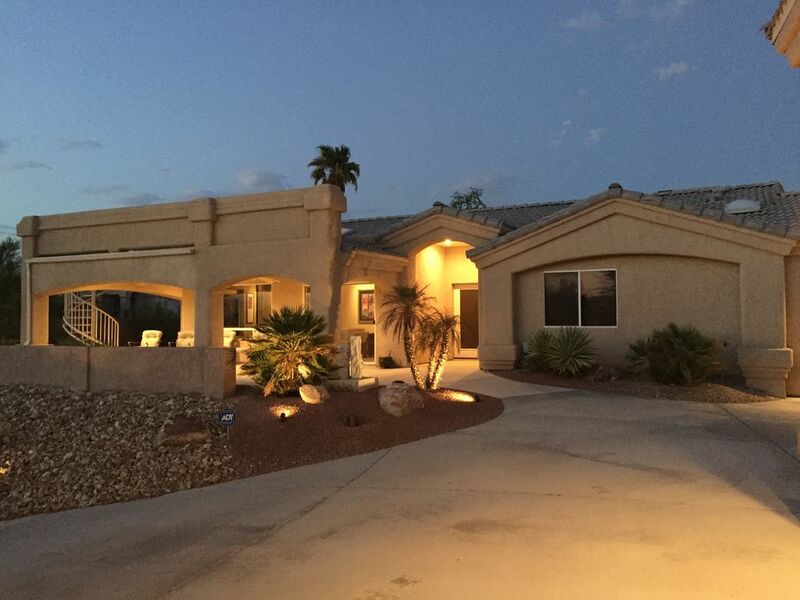 We stayed at this house for the month of November to golf with friends from Kingman AZ. The house is very roomy & open. The website pictures look good & in real time it is much better. The view of the lake to the west is great. Many places say they have a lake view. This is a Lake View. The house was well maintained and completely move in clean. It is a very quiet area that is close to everything. We only had one problem which was we couldn't get onto the internet when we arrived One call to the owners got a quick response. The internet supplier came in and replaced the modem which had stopped working after the owners last visit several days before our arrival. Those things happen at home also. We read these reviews and they are so helpful. We definitely would rent this house again. Rent this place and you won't regret it. The property was exactly as described and was the best equiped of the 5 we have rented during the past 3 years. The property was clean and very well maintained. The owners were great to deal with and willing to respond quickly to any questions or requests. The property is in a great location for all shopping, golf, water or other outdoor activities. Would recommend to family and friends and hope to stay there again next year. Boating, Golfing, Fishing, Hunting, Offroading, Bowling, Movie Theaters, Shopping, Gambling 20 minutes across lake by ferry or Laughlin Nevada is 1 hour away.